Most travelers come to Puno as a means of getting to Lake Titicaca and seeing nearby Inca ruins. Founded in November, 1868 by the Spanish count Lermos. It was once a prosperous community granted city status in 1810 due to the silver mines at Laykakota. Puno Peru today is the capital of the altiplano region, a dusty, commercial border town across Lake Titicaca from Bolivia. However, Puno has a wild, exuberant side. "10-day celebration in honor of the patron of Puno.. . This first day hundreds of dance groups from the neighboring towns pay their tribute to the mamacha, showing the best of their folklore and wearing their finest costumes. This is the time to see the famous and colorful diablada where, to the rhythm of the sikuri or panpipe players, groups of dancers dressed as devils parade worshipping their patron. The image of the Virgin is taken out in procession crossing the main streets of the city of Puno. The following days are celebrated throughout the area with fairs, festivals, drink and dancing day and night." The city of Puno celebrates its founding during the first week of November and throughout the year, on Sunday mornings, the Plaza de Armas is the site of military parades, music and ceremonies. During Puno Days, on November 4 and 5, a lavish procession and masked dancers celebrate the beginning of the Inca Empire when Manco Capac and Mamá Occlo rose forth from Lake Titicaca. Puno is 12,350 ft (3827 m) above sea level, dry and cold, very cold at night. If you are senstive to the altitude, allow yoruself time to acclimatize to the altitude. Coca tea is available and seems to help the acclimatization process. The town is hospitable, with plenty of restaurants and lodging options, from the very basic to the luxurious. When you register at a smaller hotel, ask about the overnight heating. You might need your own sleeping bag for extra warmth. Reserve ahead for the February and November celebrations. By air, flights from Lima, Cuzco and Arequipa via Aero Continente and other domestic airlines arrive daily at Aeropuerto Manco Capac in Juliaca, 31 miles (50km) north of Puno. 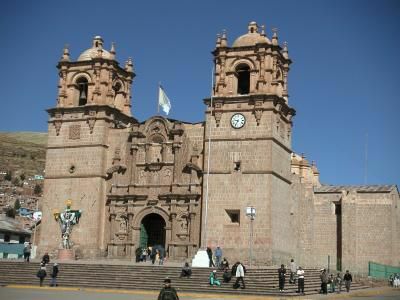 If you're with a tour, the agency will arrange transfers to Puno; else you may take a taxi, or the cheaper shuttle bus. By train, you have a choice of the 10 hour night, Pullman class train between Arequipa and Puno. ENAFER keeps the cars locked so you can sleep, although the ride might be rocky and rough. By day, the trip across the altiplano offers great scenery and stops to allow photos at the highest point. This trip takes about 12 hours, with a stop in Juliaca. Watch your belongings. Although the lake crossing to Bolivia was the main way of travel in Inca and colonial times, today there is no direct crossing. Now you will first take the bus to Copacabana, then the hydrofoil to Huatajata and on to La Paz by land. There are ample boats for the trip to the Floating Islands, or to fish for the local trout and pejerey. By road, you can take a bus from Moquegua, Tacna and other locations. This Puno Peru article was updated October 31, 2016 by Ayngelina Brogan. Silustani, the city of the dead, is about 19 miles (30km) from Puno and the site of the circular towers known as chulpas for the shrouds used to wrap the mummies entombed in the towers, which are properly named ayawasi. The city sits on a peninsula of Lake Umayo and is tremendously scenic. For the best view, climb to the top of the hill, an easy climb up wide steps. If you take pictures of the local shepherds or young girls selling souvenirs, offer a small fee. When in Pomata, 12 m (20 km) from Puno, don't miss the church of Santiago Apostle with baroque carvings, pink granite, and altars covered with gold leaf. Chuquito is an agricultural lakeside community of terraces where tortora raft making is a main industry. In colonial times, it was an administrative center for the area. Cerrito de Huajsapata is a small hill with a monument to Manco Capac and a great view of Lake Titicaca. Lake Titicaca, revered as the Cradle of Inca Civilization is the main attraction. Thousands of visitors come to see the famous Floating Islands, home to the Uros Indians who still practice their traditional lifestyle and build the famous totora reed rafts. Though the islanders are becoming increasingly more aware of the economics of tourism, visiting them and their way of life is an experience not to be missed. The Uros maintain their islands by adding new reeds to the top when the bottom ones rot away. They will give you a ride on a tortora boat, for a fee, and if you wish to photograph them, ask first and negotiate a price. The island most visited is Taquile, where the Uros wear colorful, traditional clothing, speak Quechua and promote their lifestyle and craft. They weave some of Peru's finest textiles, which you may purchase, along with colorful embroidery, at the island's cooperative store. There are no roads here, and electricity came to the island only in the 1990's. There are several Inca ruins on the island. Amantani, also a popular destination, is largely agricultural. Overnight stays in a local home are possible. Bring your own sleeping bag or blankets and water. A gift of fruit or vegetables to your host is very welcome. Enjoy your tour of Puno and Lake Titicaca. Buen viaje!